Recently when on out and about in Newcastle with my boyfriend we took a stroll hand in hand down Northumberland Street. We passed Haymarket Metro station and before we knew it a delicious waft of flavourful scent entered our noses. We were extremely intrigued by this tasty smelling scent. Shortly after we discovered the smell was coming from a place called Shijo Cafe. Shijo Cafe is a Japanese style place that serves the likes of ramen, yakisoba, Japanese style curry, gyozas and soups amongst other dishes. The menu isn’t massive but it is very respectable considering the place is quite small. Since discovering Shijo we’ve been back a few times now. On our first visit, we tried their Chicken Katsu noodle soup. The dish consisted of tasty noodles in a delicate delicious broth and a separate dish of breadcrumbed chicken. The dish was tasty and very filling. However, we decided on our next visit we’d try one of their curry dishes. Boy oh boy are we glad we did. 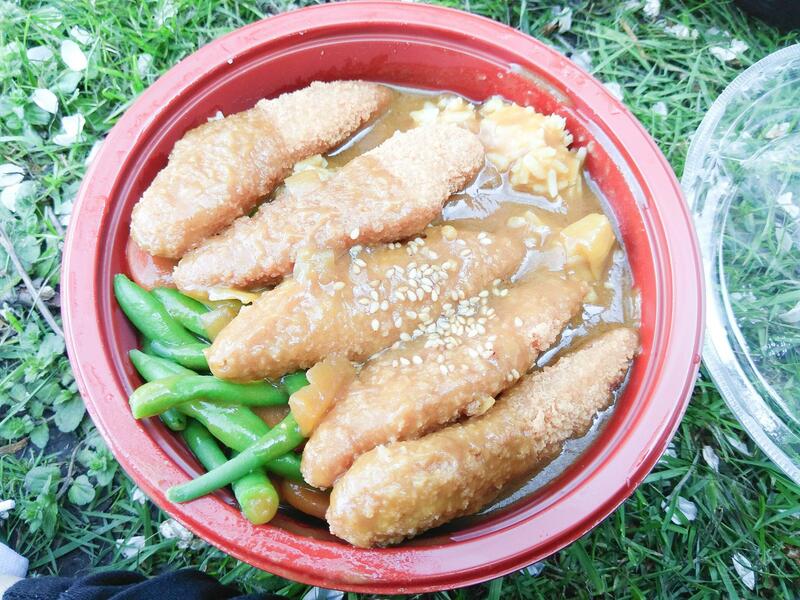 The next time we went we got their chicken katsu curry and we were left very satisfied. At £5.50 a pop the portions are huge and will definitely fill you up. Both my fella and I were totally stuffed after devouring our curry dishes. So what do you get in the dish? Well, you get a boatload of rice, carrots, green beans, your breadcrumbed chicken and of course your curry sauce. The curry sauce is on the sweet side but it isn’t sickly nor is it really spicy. However, it is very tasty. Sure it isn’t the most amazing curry I’ve ever had. However, for the price it is ideal. Plus when you are after something affordable to fill you up at lunchtime, this is the perfect option. Speaking of which, just last year Shijo Cafe was actually voted the best lunch spot in Newcastle according to The Tab. The super clean Japanese style cafe is unsurprisingly popular with students with it even offering students a discount on rice dishes and noodle soup. It’s so popular that they are actually opening up a second location situated across from the computer science building at Northumbria University which I suspect will do very well. Currently, their Haymarket location gets very busy, especially at lunchtime. However, the staff are very friendly, service is always super quick and you always get piping hot food so you can’t really complain. The only downside is that if you’re wanting to sit in and eat you may struggle to find a spot because the place isn’t that big. However, on a lovely sunny day, I recommend you get your food to go and take the short walk to the Civic Centre. Just outside there is plenty of space to sit where you can enjoy both your food and sunny Newcastle. Shijo is a great little place to grab lunch and makes a lovely change from the usual fast food options available like McDonald’s and Greggs. If you like Asian food, you want something that is going to fill you up and you don’t want it to cost you an arm and a leg, Shijo Newcastle is the place to go. Have you tried anything from Shijo Newcastle?